Watch this video for a clear example of how changes in interest rates can impact investment, which in turn affect consumption, which can shift aggregate demand. If the economy is suffering a recession and high unemployment, with output below potential GDP, expansionary monetary policy can help the economy return to potential GDP. Figure 1(a) illustrates this situation. This example uses a short-run upward-sloping Keynesian aggregate supply curve (AS). The original equilibrium during a recession of Er occurs at an output level of 600. An expansionary monetary policy will reduce interest rates and stimulate investment and consumption spending, causing the original aggregate demand curve (AD0) to shift right to AD1, so that the new equilibrium (Ep) occurs at the potential GDP level of 700. Figure 1. Expansionary or Contractionary Monetary Policy. (a) The economy is originally in a recession with the equilibrium output and price level shown at Er. Expansionary monetary policy will reduce interest rates and shift aggregate demand to the right from AD0 to AD1, leading to the new equilibrium (Ep) at the potential GDP level of output with a relatively small rise in the price level. (b) The economy is originally producing above the potential GDP level of output at the equilibrium Ei and is experiencing pressures for an inflationary rise in the price level. 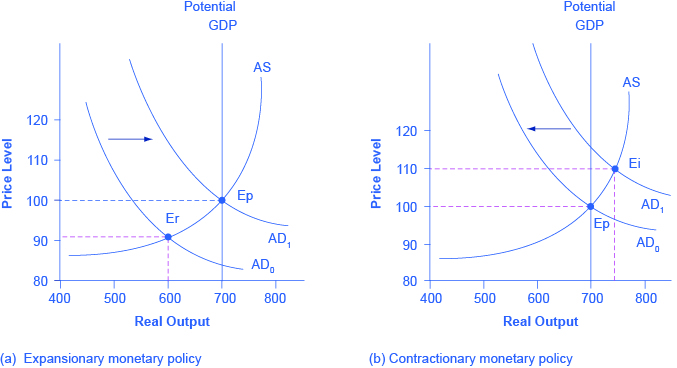 Contractionary monetary policy will shift aggregate demand to the left from AD0 to AD1, thus leading to a new equilibrium (Ep) at the potential GDP level of output. Conversely, if an economy is producing at a quantity of output above its potential GDP, a contractionary monetary policy can reduce the inflationary pressures for a rising price level. In Figure 1(b), the original equilibrium (Ei) occurs at an output of 750, which is above potential GDP. A contractionary monetary policy will raise interest rates, discourage borrowing for investment and consumption spending, and cause the original demand curve (AD0) to shift left to AD1, so that the new equilibrium (Ep) occurs at the potential GDP level of 700. These examples suggest that monetary policy should be countercyclical that is, it should act to counterbalance the business cycles of economic downturns and upswings. Monetary policy should be loosened when a recession has caused unemployment to increase and tightened when inflation threatens. Of course, countercyclical policy does pose a danger of overreaction. If loose monetary policy seeking to end a recession goes too far, it may push aggregate demand so far to the right that it triggers inflation. If tight monetary policy seeking to reduce inflation goes too far, it may push aggregate demand so far to the left that a recession begins. Figure 2(a) summarizes the chain of effects that connect loose and tight monetary policy to changes in output and the price level. Figure 2. The Pathways of Monetary Policy. (a) In expansionary monetary policy the central bank causes the supply of money and loanable funds to increase, which lowers the interest rate, stimulating additional borrowing for investment and consumption, and shifting aggregate demand right. The result is a higher price level and, at least in the short run, higher real GDP. (b) In contractionary monetary policy, the central bank causes the supply of money and credit in the economy to decrease, which raises the interest rate, discouraging borrowing for investment and consumption, and shifting aggregate demand left. The result is a lower price level and, at least in the short run, lower real GDP. Watch this video to take yet another look at the way that monetary policy can, through a reaction chain, affect aggregate demand.